The McCoy Inverted Jenny Position 76 sold today for $295,000 at an auction conducted by Robert A. Siegel Auction Galleries. 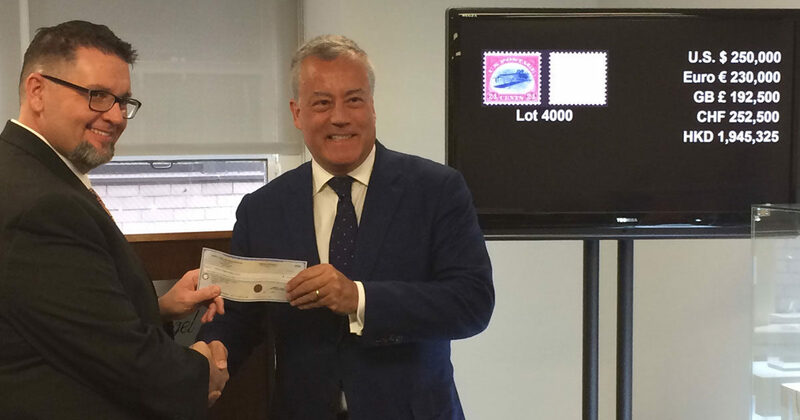 The identity of the winning bidder was not immediately revealed, but the stamp was sold to a bidder on the phone at the New York City auction headquarters. Floor and Internet bids also were accepted. With buyer’s fees added, the winning bidder will pay $295,000 ($250,000 was the high bid) for the iconic 1918 stamp that shows a biplane flying upside down. The sale featured the American Philatelic Research Library’s Inverted Jenny stamp recovered a year ago. The stamp was stolen along with three others during a 1955 national stamp show in Norfolk, Virginia. 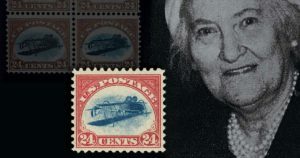 The block of stamps was owned by Ethel McCoy when they were stolen. Later, McCoy willed the stamps to the APRL. Two stamps were recovered in the late 1970s; one was sold and the other is retained and often exhibited by the American Philatelic Society, a sister organization to the APRL. The stamps were part of an original sheet of 100 error stamps purchased in 1918 by William Robey from a post office in Washington, D.C. The stamps were printed hastily to help inaugurate the country’s inaugural airmail service. APRL Librarian Tara Murray and Scott D. English, the APRL’s administrator and APS executive director, journeyed to New York City from the library’s home in central Pennsylvania to witness the sale. Pictured above is English (left) receiving a check from Scott Trepel President of Robert A. Siegel Auction Galleries Inc. Proceeds from the sale will go to the APRL’s new library facility at the American Philatelic Center in Bellefonte, Pennsylvania.